Title: The history of economic activity of the Yolngu people in Arnhem Land – then and now. Joanne Garnggulkpuy is an experienced teacher, Wangurri elder and social researcher. A co-founder and now Managing Director of the Yalu’ Marnggithinyaraw Research Centre at Galiwin’ku, she has guided and mentored many research projects, helped develop the Yothu Yindi school curriculum, has been involved in Menzies School of Health research and has been Secretary and Chair of the Council for Aboriginal Alcohol Program Services, NT. Garnggulkpuy is currently Manager of Yalu which is working on the Stronger Communities for Children Program with the Red Cross; and a Cultural Mentor Program. The Yalu IPS Program is teaching young children and families about kinship systems and Yolngu culture. Dr. Gwenda Baker is a Professional Historian with a long relationship with the people at Galiwin’ku. 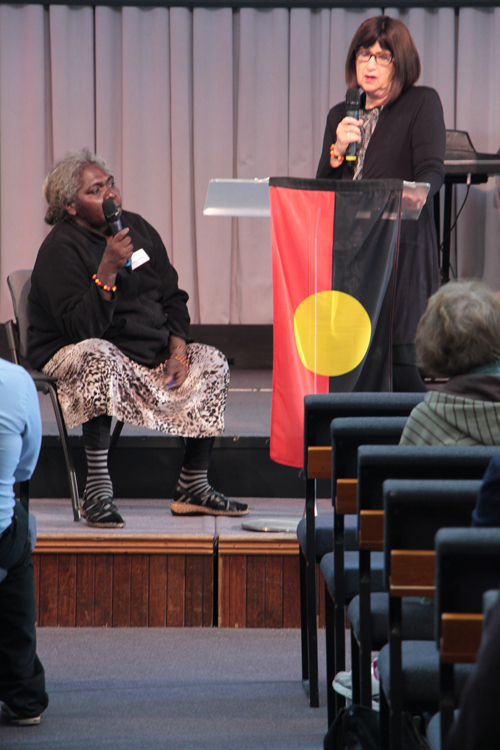 In 2010-2011 she was a co-researcher with Joanne Garnggulkpuy on a project recording Yolngu stories about life on Elcho Island during the time of the Methodist Mission. She has written on the intersections between Aboriginal religious beliefs and Christianity; the re-interpretation of missionary activity by Aboriginal leaders; Aboriginal women and their spiritual, social and political leadership; and the fight for Land Rights. Gwenda is currently the Australian Religious History Fellow at the State Library at New South Wales and Adjunct Research Fellow at the Monash Indigenous Centre. Title: How did we get here? The social, political and economic story of Arnhem Land and hopeful ways forward. Title: The Road to Restoration: So many attempts at ‘helping’ Indigenous communities have proved counter-productive. What does the Bible tell us about what healing and restoration requires of Indigenous communities and those who would walk with them? To stay informed of any future events that the AHED Project will be organising near you, sign up to our e-news. For more information about the AHED Project, see our website. Born in Orange NSW, trained as a fitter and turner. Moved to Arnhem Land in 1973 one year for voluntary work, ended up staying 37 years, learnt language and trained in community development work. Wrote “Why Warriors Lie Down and Die” in 2000. Established Yolŋu Radio in 2003. Was CEO of ARDS Inc for 10 years. Developed discovery education methodology. Runs ‘Bridging the Gap’ seminars and training workshops, does conferencing speaking. Wants to build an e-learning school for Yolŋu people using both their own language and English so Yolŋu children and adults have a schooling system that works for them; plus one they can access anywhere. Trying to write my next book “When a New World Drops in on You”.